CALM is delighted to announce further high profile support with the appointments of actor Jamie Campbell Bower, Founding Director of After Nyne magazine Claire Meadows, and alternative rock band Young Guns, as official charity Ambassadors. Claire Meadows, who founded After Nyne magazine in 2013, joined the team at the start of November, and has already publicised CALM via local broadcast media interviews and social media, as well as providing promotion of other CALM supporters. 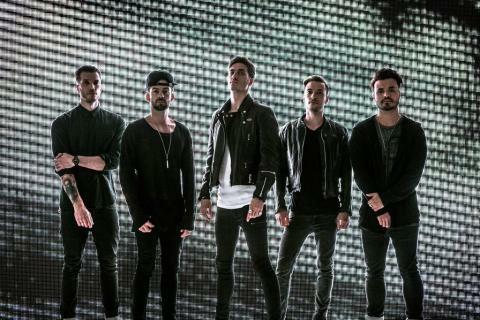 Young Guns, from London, released their first EP, Mirrors, in 2009 and have found notable success with three albums, their latest ‘Ones And Zeroes’ making the top 10 in the Official UK Charts, and their 2012 single, ‘Bones’, reaching no.1 on the Billboard Active Rock charts in the USA. After lending their support to the charity’s recent #BiggerIssues campaign, the band’s exposure in the likes of Kerrang! And Rock Sound magazine, including numerous covers, combined with a large social media following is ideal in raising awareness among the rock scene. Also joining the CALM team of Ambassadors is actor and musician, Jamie Campbell Bower, best known for his role as Anthony Hope in Sweeney Todd: The Demon Barber of Fleet Street and Caius in hit Hollywood franchise Twilight. Jamie will begin raising awareness of CALM via the UK tour of his punk rock band, Counterfeit, starting with a gig at London’s O2 Academy, Islington, on 18th December. "We’re absolutely delighted to have Claire Meadows, Young Guns and Jamie Campbell Bower join our team of Ambassadors. CALM is for and on behalf of men, so it’s important that we reach guys via their interests and influential voices. After Nyne, Jamie and Young Guns are engaged with the cause as well as with CALM’s ethos, and as such are ideal for communicating our message." The Campaign Against Living Miserably, CALM, is an award winning charity dedicated to preventing male suicide in the UK. Founded in 2006 the charity seeks to prevent suicide by providing a service for men who are down or in crisis, and by fomenting cultural change so that any man considering suicide feels able to seek help. CALM supporters and advocates include the likes of David Baddiel and Professor Green, Dizzee Rascal and Frank Turner, and its offbeat brand and challenging advertising have proven effective in reaching men across the UK. In the past 12 months, CALM has taken over 40,000 callers via its helpline and webchat. CALM’s free, confidential accredited helpline and webchat service are available every day of the week from 5pm to midnight, staffed by professionals, on 0800 585858 (national) 0808 802 5858(London) and www.thecalmzone.net. CALM is reg. charity no. 1110621. There were 6,109 probable suicides in the UK in 2014 of which 76%, or 4,623, were male. Suicide is the biggest single killer of men aged under 45 in the UK (NISRA, GRO, ONS 2014). Prior to publication, it must be approved by CALM.